Attention: Hollywood has accidentally made a mainstream movie that involves race without a substantial white savior character. Kevin Costner comes very, very close to engaging the trope when he goofily obliterates a “Colored Women’s Restroom” sign. But, by and large, Hidden Figures keeps the focus on the bold, brave, brilliant heroines at its core, even going so far as to have a nuanced rebuke of typical modern naïve racism while Kristen Dunst washes pee off her hands. It’s not quite “putting a man on the moon,” if only because it seems easier to have put a man on the moon than to find popular culture that’s responsibly representative. Hidden Figures is the story of Katherine G. Johnson (Taraji P. Henson), Dorothy Vaughn (Octavia Spencer) and Mary Jackson (Janelle Monáe), three women of color who were hugely responsible in helping put an American in orbit. NASA named a goddamned computational research facility after Johnson, and yet her impact and that of her peers has gone wildly unnoticed. Director Theodore Melfi and screenwriter Allison Schroeder, working from Margot Lee Shetterly’s book, do a more than serviceable job remediating our collective ignorance. Johnson is a numbers wizard working as a computer, which is a thing we used to call human beings who computed things before computers were computers. Her boss, Al Harrison (Costner), is so laser-focused on beating the Russians in the 1960s space race that he doesn’t even recognize the guy from The Big Bang Theory (Jim Parsons) is right there acting just like he does on The Big Bang Theory! Johnson crunches space algebra, Vaughn becomes self-trained on the first IBM computer, and Jackson desegregates a whole state’s education system so she can become an engineer. Meanwhile, Dunst demonstrates a wide variety of accents, all at the same time. Hidden Figures is by no means a perfect movie. Henson thinks playing a smart woman means pushing glasses up from the bridge of her nose every 2-3 seconds. Little tension is ratcheted from a “life and death” situation in which we know that famous astronaut John Glenn (Glen Powell) is gonna be just fine. And the game-changing question “what about old math” deserves every laugh its serious Costner-ian delivery demands. Yet, the movie holds together, wibbling and wobbling like a shuttle reentering the earth’s atmosphere, but filled with killer moments. Like when Dunst asserts that she has “nothing against” black people. Spencer’s response is powerfully relevant and applicable to most contemporary “casual” institutionalized racist behavior: “I’m sure you believe that.” Hell, watching talented men in the movie, Aldis Hodge and Mahershala Ali, relegated to the “doting astronaut’s wife” roles found in most space movies is delicious in its own right. 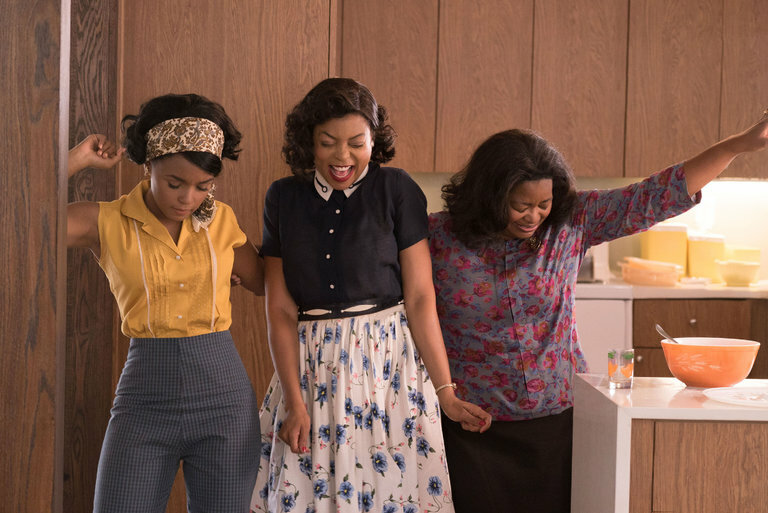 Hidden Figures is schmaltzy, cheesy, feel-good, rah-rah cliché. But it’s schmaltzy, cheesy, feel-good, rah-rah cliché that educates us by showing powerful, real women of color as the brilliant heroes they were. It glorifies intelligence at a time in America when we see the trait attacked on a daily basis. And it shows us that the STEM fields are not now, nor were they ever, a “boy’s only” or “white’s only” club.